It is with great pleasure and satisfaction that Roadmaster Booking announces a new partnership for the upcoming European tour of the brazilian thrashers, VIOLATOR. 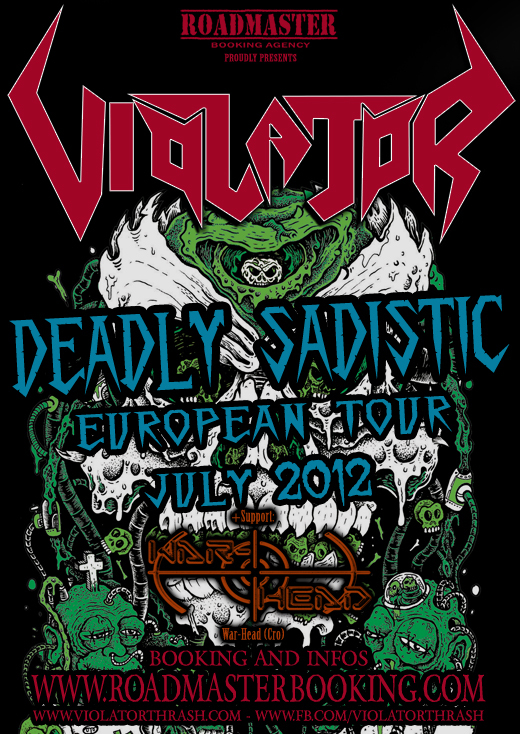 The “Deadly Sadistic European Tour 2012” will take place in July. Immediately after the marathon of shows, the band will enter Stage One Studio (Germany) to record their second full length album under the responsibility of the producer Andy Classen. “Violator is a band that values the do-it-yourself ethics and the bonds of friendship formed in the underground network. Our partnership with the group of people who set up the Roadmaster has been going for many years, in other trips to Europe and South America. This new tour only confirms that you can be fully productive in the underground guided only by passion to the noise and not by money”, says the vocalist and bassist, Poney.